It’s been a year of ups and downs for Alan Johnson Racing and 2013 Top Fuel World Champion Shawn Langdon. After unexpectedly losing sponsorship right before the 2015 NHRA Mello Yello Drag Racing season kicked off, Alan Johnson Racing was able to scramble and secure enough funding to race in the Winternationals. Langdon’s top notch performance in Gainsville helped the team gain enough support from Toyota Motor Sales to keep the Knuckle Sandwich dragster running. Until now. Alan Johnson Racing made the announcement today that it will withdraw temporarily from NHRA Mello Yello Drag Racing Series competition effective immediately. When the team is able to secure adequate sponsorship, it will resume competition. The season has been a mixed bag –the win in Florida was the quickest run in the history of the sport during the event. But in the last three races, the team has had a runner-up finish and two semifinal appearances; last month in Brainerd, Minn., the Knuckle Sandwich Toyota dragster recorded a 3.662-second elapsed time – the quickest in NHRA history. 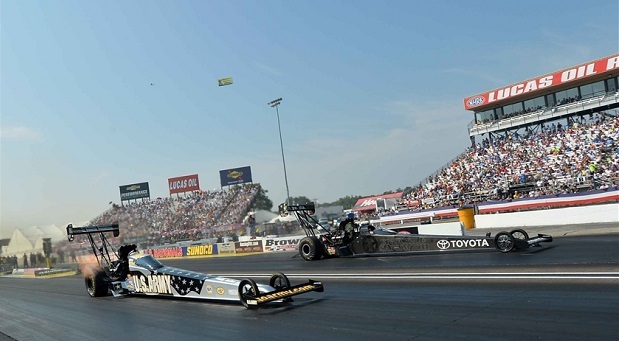 The team finished the regular season in good form and was seeded sixth in the Countdown to the Championship NHRA Playoffs which begin a six-race run this weekend at zMAX Dragway near Charlotte. However, despite exhaustive efforts that began in early January, sufficient sponsorship has not yet been secured. Due to the lack of funding, Alan Johnson Racing will temporarily suspend racing operations. Alan Johnson Racing won NHRA Mello Yello Top Fuel World Championships in 2013, ’11, ’10, ’00, 1998 and 1997 and was poised for a run at the 2015 World Title.